When I started to learn about TENUGUI, I was of course also interested in how TENUGUI were made. Originally I had thought they were machine printed like other fabrics, handkerchieves and those sorts of things, but was surprised to learn that they were hand dyed. pour the dye using special pot called "Yakan" or "Dohin"
The Japanese word shokunin is defined by both Japanese and Japanese-English dictionaries as ‘craftsman’ or ‘artisan,’ but such a literal description does not fully express the deeper meaning. The Japanese apprentice is taught that shokunin means not only having technical skills, but also implies an attitude and social consciousness… The shokunin has a social obligation to work his/her best for the general welfare of the people. This obligation is both spiritual and material, in that no matter what it is, the shokunin’s responsibility is to fulfill the requirement. I realise now that the people I saw in the short video were not just ‘craftsman’, but ‘shokunin’. our instructor was a young girl! When the instructor was showing us how to do it, it looked quite easy, but when I experienced it, I found it quite difficult. 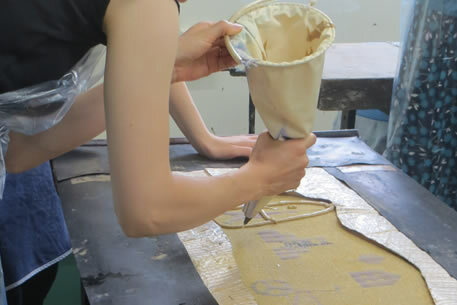 Especially when putting the dye-resistant paste on the cloth, if you are not pressing a wooden spatula onto a cloth evenly, some parts get more paste and that can change the result. Pouring dye is also tricky - when you want to express a lovely gradation in the colour, you have to hold two pots in each hand and pour two different dyes at the same time. this MANGA explains how to make CHUSEN TENUGUI A typical Japanese way of learning! Temperature, humidity, and the timing of when the ‘shokunin’ stops pouring their dye, all these small things can make a difference in each TENUGUI. That’s why each TENUGUI is unique! 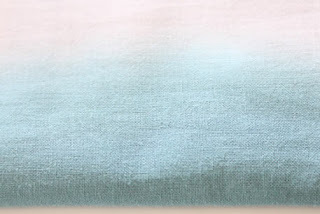 These days when I receive TENUGUI products from Japan, now I appreciate the different aspects a lot more - in the colour gradation, bleeding and soft lines of each TENUGUI, I can feel the shokunin’s pride there. 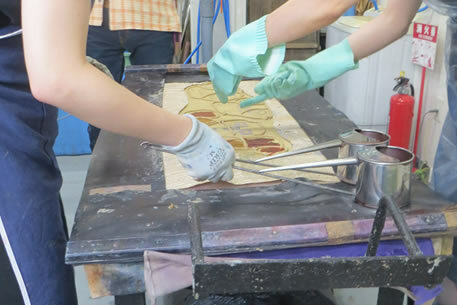 If you find a very cheap TENUGUI, it might not be made by this traditional Chusen method. I have often seen TENUGUI at a 100 yen shop (like a dollar shop!) in Japan. 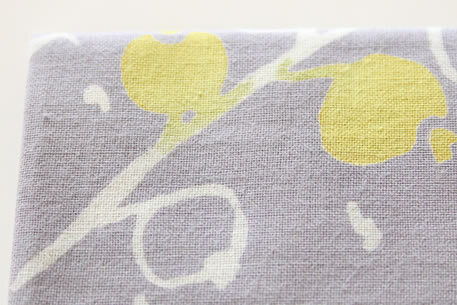 If you kinda like the pattern and want to use it without worrying about how to care for it, this can be okay. 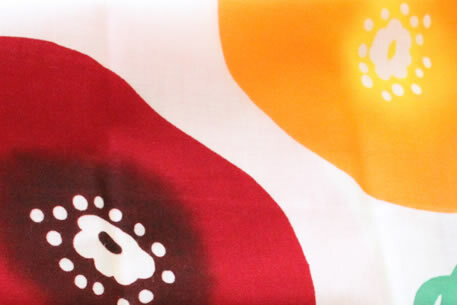 But if you want to get a traditional TENUGUI, make sure you check the back of it. 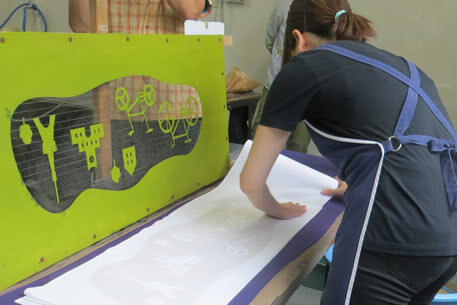 The back of machine printed TENUGUI is plain, but for CHUSEN TENUGUI, you cannot really tell which is the front or back, because the both sides are dyed. 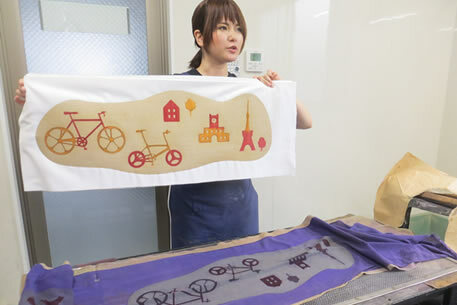 This is another difference between Chusen and other dying methods, like screen printing - all these details make me appreciate TENUGUI and the work of the shokunin masters more and more. Do you want to learn a little bit more about TENUGUI? 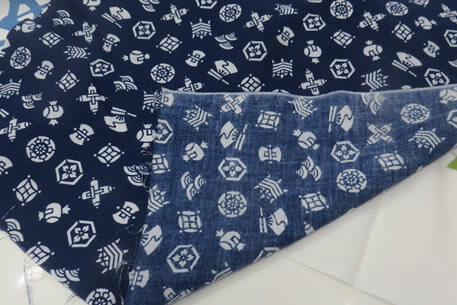 I will write about the history of TENUGUI next week! 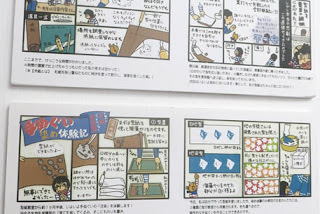 Win a cute, exclusive Tokyo Tenugui!